Do you wish to bring back the good look of your windows rapidly and efficiently?Are you searching for methods of effective window washing? If the answer is positive, you have come to the right company! With the experts of window cleaning in Blackwall, you will successfully bring back the daylight into your property. You will enjoy impeccable windows as well as superbly clean frames and sills. You will be able to use your freshly-acquired leisure time as you want to while we polish the glass surfaces of your property. You will not only stay away from this monotonous and troublesome work – our services will in addition to that give you some attractive benefits. We also provide our professional services in nearby areas: Leamouth, Westferry, East India, Mudchute, London Arena. We provide first class window cleaning by using advanced equipment. We deliver perfect and pristine look for your glass surfaces, roof windows and conservatories with water-fed cleaning system and high pressure cleaning. The poles we use are connected to water supply devices in our vans, thus excluding the risk of damage to the exterior of your home or workplace. In addition, we use entirely safe rope access equipment to clean glasses on high-rise buildings. You can benefit from these techniques now – give us a call on 020 3746 3113! With our professionalism and technical proficiency, you can rely on us for domestic and commercial window cleaning. Your property will look pristine after the services, regardless what type of windows you have. We thoroughly wash small, double or sash windows, French doors, bay windows and patio doors. Moreover, we clean skylights, garden windows and conservatories. In other words, you can depend on us for flawless cleaning of your windows, including frames and sills. You can enjoy perfectly looking workplace with the help of the specialists of commercial window cleaning. You can rely on our first-rate services for all kinds of business premises. For instance, if you own a small shop, we can thoroughly clean its windows by using water fed extension pole tools – it helps us to go as high as the fourth floor. If you search for spotless look for the glass panes of a skyscraper in London and the surrounding areas, we will put in use our rope access tools. In both cases, you will enjoy excellent results in no time. 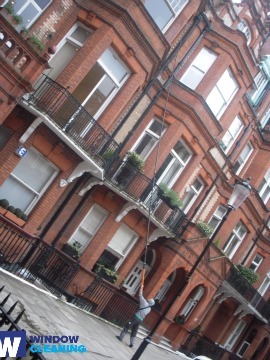 Benefit from our residential window cleaning in Blackwall – we provide top-notch services for your home on low prices. We use purified water to clean the windows completely. We use ground-based water-fed pole method. Find us now - call 020 3746 3113 or just use our booking form. Our operators will help you place an order and answer all of your questions. You will love the end-results of our household services, we assure you to that! The nearest tube station serving E14 Blackwall is Canning Town.